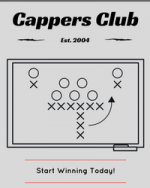 Cappers Club NBA + CBB Season Pass! 288-265 run in Basketball dating back to 10/26/17. The Portland Trail Blazers and the Oklahoma City Thunder face off on Sunday and in this game the value lies with the over. The Blazers have been scoring this series but the Thunder's offense has been what has kept the scoring totals down. In game three their offense finally got going scoring 120 points and that should help push the total over this low number.